Tendinitis and bursitis are separate musculoskeletal health problems, although they often cause similar signs and symptoms. Tendinitis is inflammation of one or more of your tendons, while bursitis is swelling of one or more of your bursae -- sacs of fluid that lie under your skin. Certain supplements may help treat these common conditions. However, all supplements should be cleared with your health care practitioner before using them. Tendinitis is a common condition that can manifest in people of all ages, although active individuals -- people who play sports on a regular basis -- may be most susceptible to this sometimes debilitating condition. Your tendons -- strong, fibrous cords -- tend to lose their elasticity over time, increasing your chances of developing tendinitis as you age. 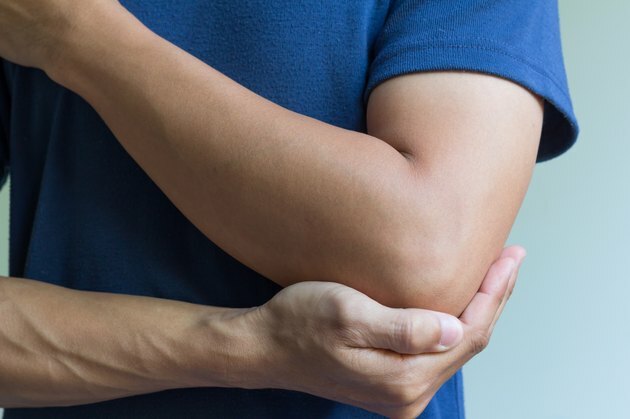 Your bursae may become inflamed and swollen by traumatic injury or from sustained repetitive movements, although infection and certain other health conditions may also cause bursitis. Dietary supplements are a time-tested approach to the treatment of tendinitis and bursitis, although scientific evidence of supplements' ability to treat these conditions may be lacking. Certified nutritional consultant Phyllis A. Balch, author of "Prescription for Nutritional Healing," reports that numerous supplements may be helpful for tendinitis and bursitis, including calcium and magnesium, pancreatin, proteolytic enzymes, zinc, vitamin C with bioflavonoids, boron, coenzyme Q10, pycnogenol, boswellia, meadowsweet and white willow bark. However, these supplements also carry a risk of side effects, so you should only take them under medical supervision. Proteolytic enzymes -- enzymes that digest protein -- may be one of the most effective dietary supplements in treating tendinitis and bursitis. Proteolytic enzymes contain powerful anti-inflammatory substances. The Dynamic Chiropractic website states that proteolytic enzyme dietary supplementation helps quell inflammation by neutralizing certain pro-inflammatory agents, which in turn allow your affected tissues to regenerate and repair themselves. In many cases, tendinitis and bursitis will heal on their own, although appropriate treatment measures may speed healing of these conditions while improving your quality of life. Not all dietary supplements may be right for you, however. Some supplements may cause undesirable side effects or interfere with the absorption or action of prescription drugs you might be taking. Dietary supplements for tendinitis and bursitis should always be used with the same caution used when taking pharmaceutical agents.